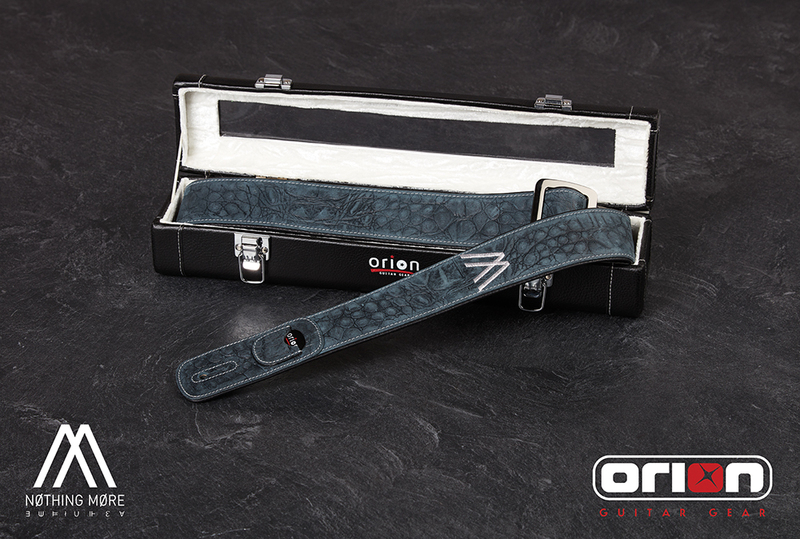 While in NYC to play at the Bowery Ballroom, Orion Guitar Gear huddled up with Mark Vollelunga (guitar) and Dan Oliver (bass) of Nothing More to create a unique custom strap of their own, and while we were at it we decided to make a few extras available to fans. The Nothing More strap is made of a dark ash grey crocodile embossed leather showing an embroidered band logo on both ends, white contrast stitching and a soft layer of pebble black leather on the inside. This is an EXTREMELY LIMITED RUN of ONLY 20 AVAILABLE TO FANS, and each one comes in an Orion Guitar Gear case, so “THIS IS THE TIME” to get your own Nothing More strap before there are NO MO left! !